I’v seen that I’v got geeky competition. Over is “my” shirt, made of shirts…. They have been knitting furiously for eight months to have the knitwear ready in time to mark the 900th anniversary of the town of Cardigan. A giant cardigan knitted to mark Cardigan’s 900th anniversary has been unveiled. 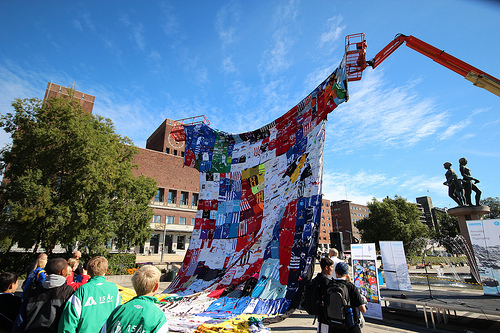 An army of 200 knitters created the 5m wide and 2.5m long garment which depicts the town’s history. It includes a castle, shops, churches and chapels, as well as portraits of local people and school children. Cardigan marked 900 years in 2010 and the cardigan unveiling marks the end of the celebrations. via BBC News – Giant cardigan marks Cardigan’s 900th anniversary.